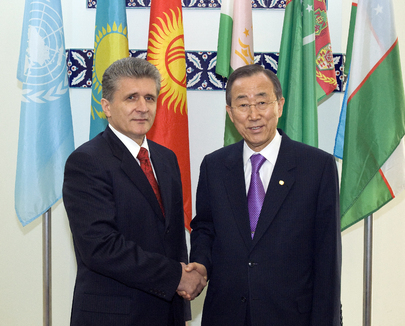 UNITED NATIONS, September 7 -- As the UN bragged of counter terrorism on Tuesday, its envoy to Central Asia Miroslav Jenca dodged questions about use and misuse of the label of terrorist in Uzbekistan and Kyrgyzstan, and the first suicide car bombing in Central Asia, last week in Tajikistan. Inner City Press asked Jenca what he and his Regional Office in Turkmenistan are doing to protect the rights of ethnic Uzbeks chased by pogroms into Uzbekistan, only to be detained by the government of Islam Karimov as terrorists? Even before Jenca could reply, the UN's helpful director of Counter Terrorism Jean-Paul Laborde cut in to remind that human rights are the domain of High Commissioner Pillay, and Jenca need not answer. He did not. Video here. For months the UN had dodged on the question of whether Jenca and his office are involved in the investigation of the causes of the violence in southern Kyrgyzstan. Tuesday Inner City Press asked Jenca himself. He said this is beyond the mandate of his office. Since his office is hardly involved in the major issue of water wars between Uzbekistan and Tajikistan, what exactly is he doing? Watch this site. 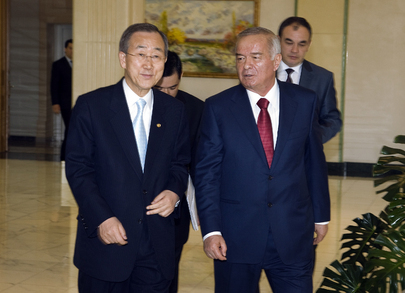 UNITED NATIONS, June 18 -- With tens of thousands of people seeking to flee attacks in Kyrgyzstan blocked at the Uzbek border, UN Secretary General Ban Ki-moon spoke on June 16 with Uzbekistan's strongman Islam Karimov. Ban did not, however, ask Karimov to open the border. This was confirmed on June 18, when Inner City Press asked Ban himself if any request had been made to open the border. Ban's two minute answer included no such request. Video here, from Minute 10:14. Nor did Ban raise to Karimov, when he visited Tashkent in April, the plight of UN-funded AIDS educator Maxim Popov, who was sentenced to seven years in prison for blasphemy. Inner City Press has twice asked Michel Sidibe, Executive Director of UNAIDS, about Popov. On June 9, Sibide told Inner City Press that "I personally tried to be sure the Secretary General during his trip to Uzbekistan was able to raise this issue" of Popov. Video here, from Minute 10:02. Inner City Press then asked Ban's Spokesperson's Office if Ban had raised it, without answer. Inner City Press asked Ban directly on June 18, saying "the head of UNAIDS said you were prepared to raise this issue of Maxim Popov, in jail for seven year." Ban did not answer this part of the question, so Inner City Press repeated it. Video here, at 13:06. Ban replied, "United Nations relevant agencies will continue to work to address that issue." Not only is the logic circular -- UNAIDS says they prepared Ban to raise the issue, then Ban says "agencies" will be the ones to raise it -- when at 6 p.m. the UN put out their transcript of the press encounter, they omitted Inner City Press' Maxim Popov question, and called the follow up "inaudible." Compare video to UN transcript, below. Inner City Press: You mentioned the people that are waiting to cross the border out of Kyrgyzstan. When you spoke with President [Islam] Karimov of Uzbekistan, did you ask him to open the border? Also, when you were in Uzbekistan, were human rights a part of your conversation with President Karimov of Uzbekistan? SG: When I had a telephone call with President Karimov just two days ago, I appreciated his willingness to accommodate 80,000 refugees who have crossed the border. I know that there is a serious difficulty in accommodating these 80,000 people and also in feeding them, providing necessary assistance. He told me that their capacity would run out in three to four days. That is why I have immediately spoken with the United Nations High Commissioner for Refugees (UNHCR) and other United Nations agencies in mobilizing all humanitarian assistance. UNHCR has delivered more than 200 tons of immediate, urgent food assistance. Now it is important that borders are open, but at the same time, I know I know that there is concerns on countries in the region of how to manage this border security when addressing all these tens of thousands of people at one time. I will continue to discuss this matter. [Special Representative] Mr. Miroslav Jenca is on the ground in Bishkek talking to all the neighboring countries and he is closely coordinating with the Special Representatives of the European Union, the Organization for Security and Co-operation in Europe, the Collective Security Treaty Organisation and Shanghai corporation organizations and other individual countries. I understand that you have been briefed by Mr. Jenca, by the way, at this afternoon's noon press briefing. So we will closely monitor what will be the best way to address this humanitarian issue including this border management. SG: Again, United Nations relevant agencies will continue to work to address that issue.